I’ve been crafting for most, dare I even say all, of my life, but truth be told I’m not very good about keeping up with my supplies. I can never find the right hook, or needle, or what have you, when I need it. I probably own 6 of them, but who knows where they are. It’s terrible I know, I’m working on it. 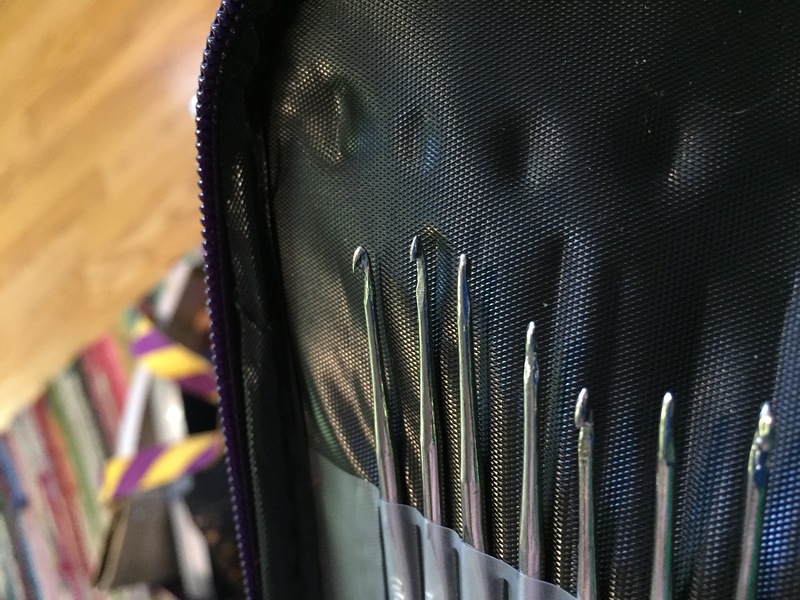 When I started this blog I knew I needed to spend time on productivity, not time searching for materials, and I opted to buy a cheap set of crochet hooks. Since I know I own all the sizes (even invested in a complete Susan Bates set ages ago) I didn’t want to spend a lot, because I’m also working on organizing all my supplies and will eventually find all the ones I own already. I had seen a cheap set of hooks all over the internet and opted to get one of them. I’ve seen it with various brands and labels, but you can usually tell it’s the same set. I’ve seen it on ebay, Amazon, Wish, and others. I ordered it from Amazon for around $5 for the set. 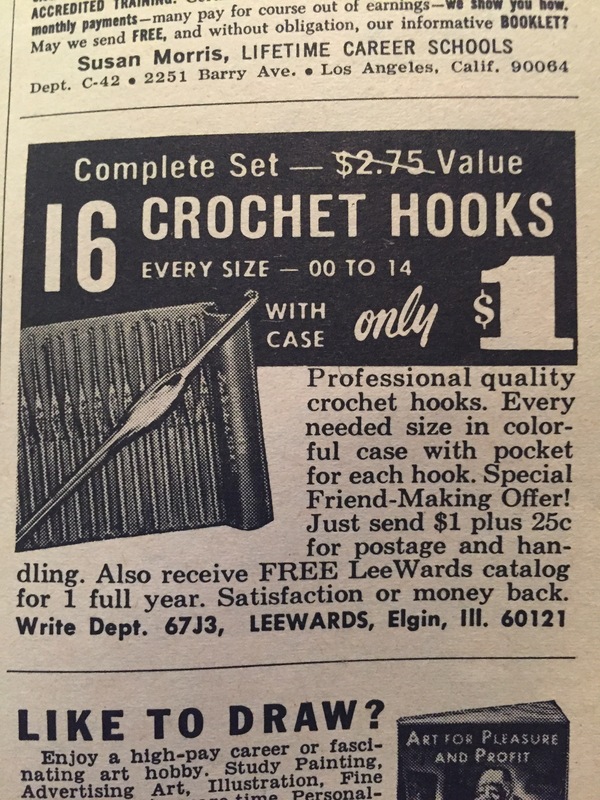 This month I saw an ad for a Crochet Hook set, originally sold by Lee Wards and it reminded me of the set I bought. Complete set of hooks, low price, very comparable to the set I bought right? The set I bought is the modern equavalent to this set. Though I’d venture to bet the Lee Wards set was much nicer. 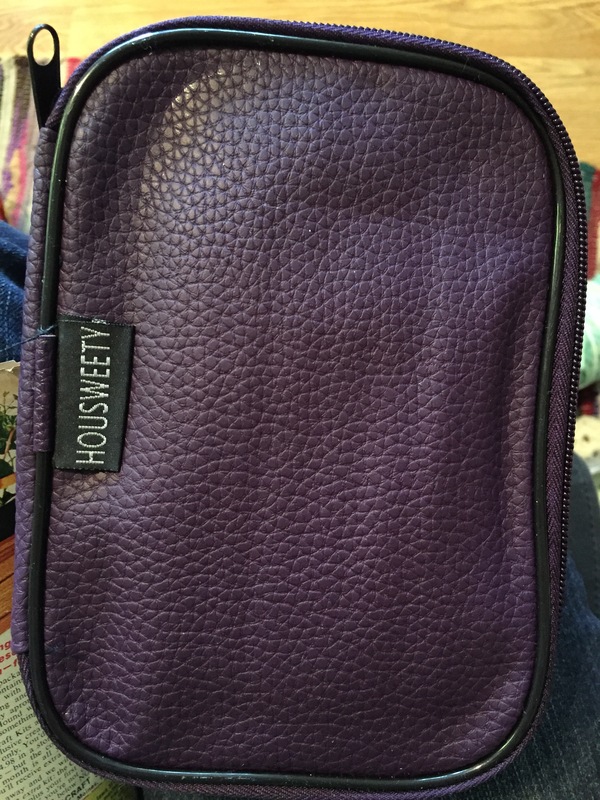 The set I bought came in a nice zipper case. Not the most amazing case, but nice enough, especially for the price. And I like that it zippers so no hooks fall out. 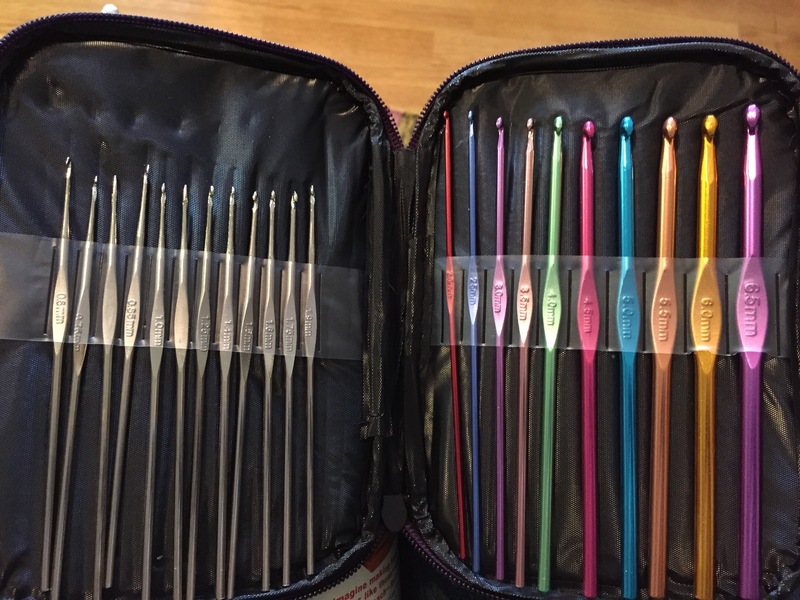 It came with quite the stash of hooks, and I was especially excited for all the small thread sizes. None of them are labelled with letter sizes, but that didn’t bother me. I tend to grab a random size that is close enough and either go for it or do a guage swatch. The larger more colorful hooks are nice, no snags, they do the job. Some people may like pointier hooks, or rounder hooks, but preference aside these do work. The steel thread hooks though are awful!!! So awful! They are not filed or cut well, they have chunks hanging off that snag the thread. In fact I even held a piece of yarn in my fingers and cut it in half by rubbing a hook back and forth on it only a few times! I’m not sure how well it shows in the photo, but trust me, it’s bad. So all said and done what’s my take? This set isn’t bad for a beginner. I’d throw out all the small hooks and just keep the colorful ones, but still a set of hooks and a decent case for around $5 is a deal in my book. In a pinch you can very carefully use the steel hooks to see if you like thread crochet, or for a small project. Also some of the steel ones were worse than others, so you may be able to utilize a few of them. So if you know you enjoy crochet I suggest investing in a better set, but this isn’t a bad set to give it a try, or for a back up set. Some other brands, while they appear identical in photos, could I suppose have better steel hooks, I wouldn’t know without buying them all. Great review and that looks like a deal for $5. Nice case. And if you get rid of the junky thread hooks, you could store your others in the same case! That was my thought too, if you slowly just upgrade to higher quality hooks you already have a decent case. So it is good for starting out!